Toys should not contain chemicals of concern that can be harmful to children’s health. To investigate the presence of brominated flame retardants, formaldehyde, benzene and other chemicals of concern in toys, WECF France organizes a toys testing action on November 16th in Paris. The convention will be an informative and interactive afternoon attended by (concerned) parents, toy manufacturers, retailers, politicians, childcare workers, etc. In short, stakeholders, just like you. After the discussion between the NGOs and EU presidency on key issues of the Environment for Europe process on 23 September 2011 in Astana, EECCA NGO made an appeal to national governments of Eastern Europe, Caucasus and Central Asia region with the request to ensure toxic free toys. 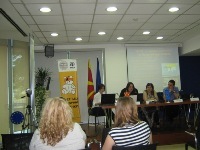 Seminar in Skopje "Journalists workshop for toy's safety"
Journalists for Children and Women Rights and Environmental Protection, a Macedonian NGO and partner of WECF, orgnised a seminar on toys safety on May 27 2011. For more information on toys safety please visit WECF website on Chemicals & Health.